The Denver Broncos have lost three straight games, but hope to turn their season around with an upset win against the high-flying Philadelphia Eagles. It’s not often that the Denver Broncos and Philadelphia Eagles meet on the gridiron. Historically, the teams have battled it out twelve times, with the Eagles winning seven of those games and holding the upper hand in the all-time series. When they do meet, the sparks often fly, with big-time points lighting up the scoreboard. The Broncos haven’t won in Philadelphia in nearly three decades, and their road trip this weekend will present a great challenge for a team looking to break a three-game skid and turn their season around. Led by second-year phenom Carson Wentz, the Eagles are the top team in the NFL sporting a 7-1 record. Without question, they are a Super Bowl contender and will be the toughest opponent Denver has faced to date. They are a well-rounded team, ranking fourth in total points offensively and have a strong defense that ranks tenth in points allowed. It’s hard to pinpoint and significant holes on their team, other than an offensive line that has had to deal with a fair amount of injuries and a secondary that has been susceptible to giving up the occasional big play. If the Broncos want to escape Philadelphia with a victory on Sunday, their front seven will have to put the heat on Wentz, whose tremendous play thus far has earned him candidacy for the league’s most valuable player honors. 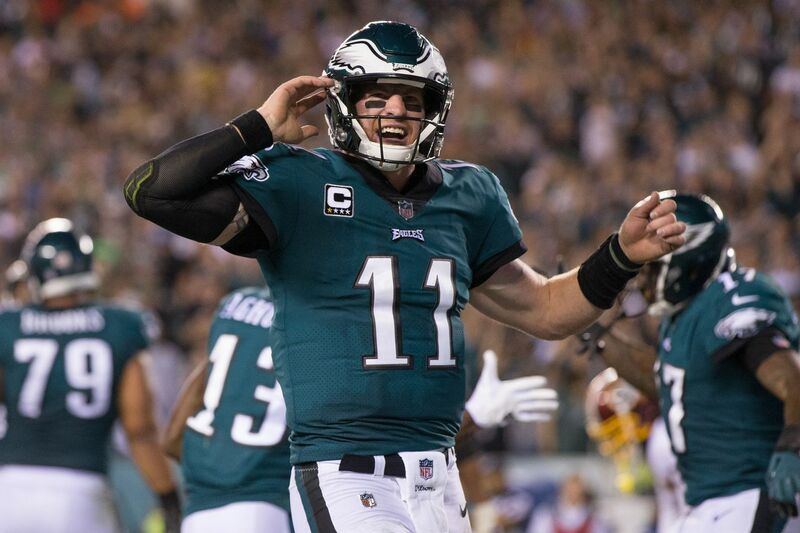 Wentz comes into Sunday’s match-up with one of the highest quarterback ratings in the NFL (101.6), but has turned in a much lower rating when under pressure. Von Miller, Shaquil Barrett and Shane Ray will need to turn the heat up a notch, and if they can, the Broncos defense just might be able to force some key turnovers and give their struggling offense a chance at success. Carson Wentz has been sacked 22 times this season on 101 dropbacks under pressure, maintaining a QB Rating of 59.8. Good luck, Philly. The one major story to keep your eye on is how well the Broncos offense will play with Brock Osweiler under center. A majority of fans are happy that the Trevor Siemian era has come to a close, but many still worry that the switch at quarterback still won’t prove to be enough for the offense to turn the corner. Osweiler doesn’t have to go out there and light the world on fire, but he can’t afford to turn the ball over and has to play smart football. If he doesn’t, the Broncos will struggle take a much needed step forward and subsequently end any hope of a surprise playoff birth in 2017. One of the greatest improvements for the Broncos this year has been the epic turnaround in their run defense. Considered one of the worst in football last season, Denver now has the league’s second-best rushing defense. The only team that is better than them statistically is Philadelphia. The Eagles are allowing just 70.4 yards per game on the ground, with big men Tim Jernigan and Fletcher Cox helping clog running lanes every week and giving opposing offenses headaches. It’s not realistic to believe the Broncos can rely on the arm of Brock Osweiler to lead them to victory on Sunday. The team can’t afford to abandon the running game and will need to employ a healthy dose of C.J. Anderson, Jamaal Charles and Devontae Booker to help get the ground game established and set up the passing game. If Denver’s offensive line isn’t able to get a push against the aforementioned Jernigan and Cox on the interior, it could be a long game for the Broncos offensively. Ronald Leary has been performing at an All-Pro level this year, but needs to have a great game going up against Cox, who has been one of the league’s best interior defenders. The Broncos must control the pace of the game and the clock, and a successful rushing attack will help them do that. In my mind, it’s the number one goal the Broncos have to achieve if they want to secure a win to help turn their season around. The No Fly Zone is still one of the league’s best secondary units, but will face a formidable challenge with Wentz and the handful of weapons he has to play with. Wentz and the Eagles offense have been money on third and fourth down conversions this year, so making sure drives aren’t extended when in those positions will be integral for any hopes at a Broncos victory. Aqib Talib will have to keep Alshon Jeffrey in check on the boundary, who is a threat to score deep any time he gets the ball in his hands. Furthermore, Justin Simmons and Darian Stewart will have to step up and make sure Zach Ertz doesn’t roll through the secondary like Travis Kelce did last weekend. If they can limit the prowess of Jeffrey and Ertz in the passing game, I like Denver’s chances on Sunday. If they aren’t able to, I’m just not sure their offense can keep up and do enough to lead them to victory on the road. I don’t enjoy ever picking against the Broncos, but a franchise in complete disarray heading on the road to secure a win against the league’s best team will not be an easy endeavor. I believe Denver’s defense will continue with business as usual and give Wentz and his teammates fits on offense, but I’m not nearly as confident that this will be the game the offense turns it around and finally performs at an acceptable level. Is one week of preparation with the first-team offense enough time for Brock to make magic happen? I doubt it. Denver falls short in a hard-fought battle with Philadelphia and stretches their losing streak to four games.